TechPowerUp got its hands on exclusive pictures of the ASUS Radeon HD 7970 DirectCU II edition, you can check it out over here. 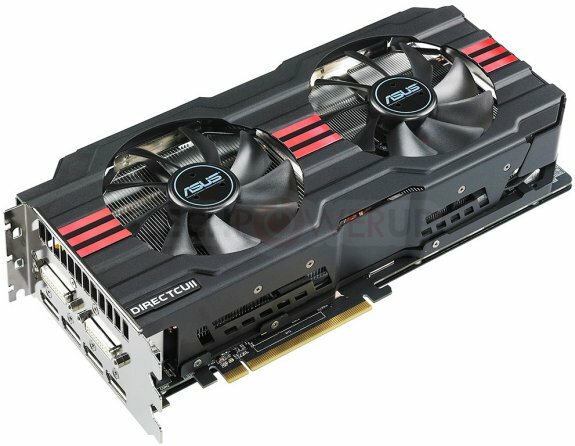 Here are the first pictures of ASUS' premium DirectCu II graphics card designed around AMD's Radeon HD 7970 GPU. The design is based on giving the GPU a powerful cooling solution, backed by a custom-design PCB. Since its cooling solution spans across three expansion slots, one of the three expansion slot brackets is productively used to provide additional display connectivity. To begin with, the PCB uses a 10+1+1 ASUS Digi+ VRM that draws power from two 8-pin PCIe power connectors. It supports heavy overclocking, and provides several voltage tuning features. A common metal heatsink spans along the length of the card, making contact with VRM and memory components. On top of this sits the DirectCu II heatsink. This heatsink uses a large aluminum fin-stack heatsink to which heat from the GPU is conveyed by six heat-pipes, which make direct contact with it. The heatsink itself isn't very thick, but what makes the card span across three slots are its two 100 mm fans. The GPU is clocked out of the box at 1000 MHz (vs. 925 MHz reference), and 5.60 GHz/1400 MHz actual memory (vs. 5.50 GHz/1375 MHz actual reference).